Curious about essiac tea? Here's an intro. Essiac tea is an herbal remedy that is taken to help the body's immune system and to help the body detox. By boosting the body naturally, it puts the body in a better position to fight off illness and disease. Essiac has been used for hundreds of years. It originally was used by the Ojibway Indians. 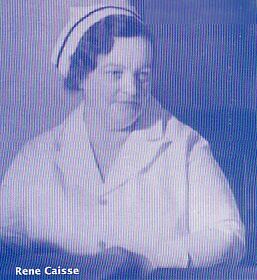 A Canadian nurse named Rene Caisse began using it and it is for her that the essiac is named (it's her name 'Caisse' spelled backwards!). It is obviously a risk to take essiac in the hopes it will help you--even though the price isn't extraordinary, it still costs money. Furthermore, you want to be sure you're taking the best stuff when it comes to your help. To help show you how confident we are in this tea, it's covered by a Money-Back Guarantee when taken as directed for six months. Click here to read about it. In addition to that, we have a whole database of questions and answers. Click here for our FAQ Page if you have additional questions or concerns about Essiac. We are also available on the phone 7 days a week: 1-978-504-9517. Click here to order our most popular size: The six month aggressive dose supply in convenient packets. Please contact us with any questions, concerns, or with your order if you'd prefer not to use the secure shopping cart. We can also send a paypal invoice is that is most convenient. Also, we ship to all countries at this time! You will see price quotes as you begin filling out the cart, or just ask us.